The projected No. 1 overall pick in the NBA draft has finally made his decision. 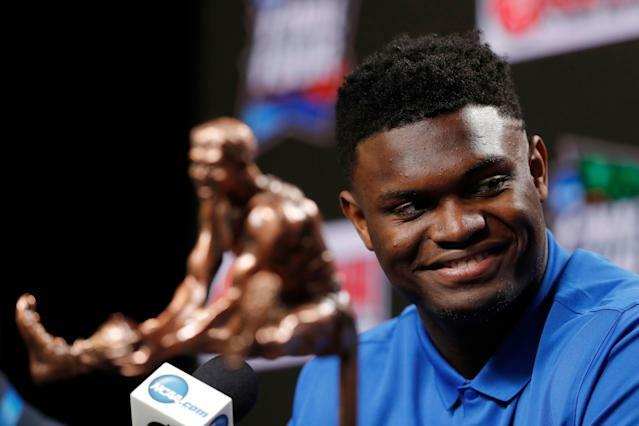 To no one’s surprise, freshman phenom Zion Williamson is going to the NBA. Williamson thanked a number of people in the video, including coach Mike Krzyzewski, his mother and Duke fans for their support. He then said it was time to take the next step forward in his career and declare for the NBA draft. The 18-year-old Williamson averaged 22.6 points and 8.9 rebounds per game during his freshman year at Duke. He helped lead Duke to the Elite Eight, where the team lost to Michigan St. by just one point. With Williamson officially declaring, Duke will have to prove it can repeat this season’s success with a vastly different cast of characters next season. R.J. Barrett, Cam Reddish and Williamson have all declared for the NBA draft, and are expected to be selected early. While Williamson is expected to be taken with the No. 1 overall pick, he doesn’t know where he’ll be playing next season. The NBA draft lottery will take place May 14. That will determine which team gets the No. 1 overall pick. It became fairly obvious early in the season that Williamson was a special player. Golden State Warriors coach Steve Kerr realized Williamson’s potential early, asking commissioner Adam Silver to not fine him after Kerr compared Williamson to LeBron James. Williamson was able to keep up that performance all season, winning the Wooden Award and being named the men’s basketball player of the year by the Associated Press.